Apples were discovered in the Middle East more than 4000 years ago. In Norse mythology, it was believed that if you ate these delicious fruits, you would live forever. The most recent historical appearance by the apple happened during the 1800s in the USA, when Johnny Appleseed (a real man actually named John Chapman) planted apple trees that provided food and a livelihood for generations of settlers. Apples are crisp, white-fleshed fruit with red, yellow or green skin. They belong to the rose family, and can be sweet or tart, crunchy or more tender-fleshed, depending on the variety. Apples are cholesterol and sodium free; eating foods like this can help to maintain a healthy heart and weight. 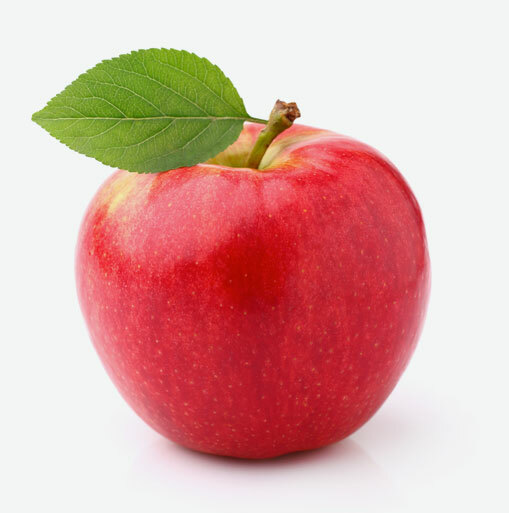 Eating an apple before a meal can also help you to feel full and can help you lose weight. They deliver a large amount of fiber, which helps to maintain regularity, and they are also a source of potassium, which helps to maintain a healthy blood pressure. Local apples start to season in late July or early August. Choose the right apple for your meal: are you eating it fresh, putting it in salad, or cooking with it? Check the varieties section below to help you select which apple variety you wish to use, and don’t be afraid to experiment. Choose apples that are firm, free of bruises and brown spots. Storing apples in the refrigerator or in an unheated section of your basement will help to keep your apples fresher. Apples do absorb odours, so if you are storing them for a prolonged period of time in your garage, you may want to place them in a plastic bag and then place the bag in a large cooler with the lid closed tightly. Apples are versatile and easy to prepare. Wash apples with soap and water before use. This will ensure any contaminants on the skin of the apple don’t make it into your next apple dish. Cut out any bad or softer sections of the apple. If using apples in a salad or alone, dip them in a solution of one part citrus juice to three parts water to minimize browning. Use apples to make applesauce, apple pie, apple crisp and muffins. Apples are great in soups, chutneys, baked, and eaten fresh as a snack. Discovered as a whole tree in 1990 in British Columbia. This apple is medium to large. It is red with a pinkish red blush. The fruit is sweet, crisp, juicy and fragrant. You can use ambrosia apples for applesauce or eaten fresh. This apple was discovered in New Zealand in 1952. Braeburn apples are red with a greenish-yellow background. Their flesh is firm, crisp and juicy. This apple blends sweetness and tartness well which makes it just right for snacks and salads. It bakes well and makes an excellent sauce that requires little or no sugar. Braeburn apples store well. Cameos come from Dryden, Washington and were discovered in 1987. Cameos may be new apples, but they are quickly becoming a favourite. Cameo apples hold their shape well when cooked. They are great for baking pies and making applesauce. Their sweet, tart snap is also great for eating fresh as a snack. Cameo apples, sliced thinly, make a great addition to green salads. Cortland apples are a cross between the McIntosh apple and the Ben Davis apple. This variety is bright red and has a bit of a yellow cheek. Cortlands have a sweet flavour with a touch of tartness. They are juicy and have a snow-white flesh. These apples are great for eating fresh as snacks, mixing in salads, making applesauce, baking pies, and make great additions to fruit plates or cheese platters because they don’t brown as quickly. Crispin apples are also known as “Mutsu” apples. They have a greenish-yellow colour with a hint of orange on them. They do not brown quickly and have a tart, tangy flavour. You can use crispins in baking, cooking and for making apple cider. Empire apples are dark red with a splash of yellow or green on them. They have a creamy, white juicy flesh and they are great for making apple cider. Empire apples are a cross between McIntosh apples and Red Delicious apples. These apples are great for snacks, baked into deserts or tossed into salads. Try empire apples the next time you bake an apple pie. Fuji apples are a cross between the Red Delicious apple and the Ralls Janet apple. They are a medium-large apple, and have crisp, juicy flesh with a mild sweet flavour. Fuji apples have a yellowish green skin with an orange-red blush to them. These apples store a little longer than most other apples and they are great for making applesauce, added to a cheese platter or eaten fresh out of hand. Fuji apples are certainly worth your trip to the produce market. Golden Delicious apples are yellow or greenish-yellow in colour and have five bumps on the bottom. They made their debut in 1900 making them popular for their mild sweet flavour and thin skin. This variety bruises easily and makes a good apple to chop into fruit salads, cook into chutneys or eat fresh as a snack. The Granny Smith apple was discovered in Australia in 1868. Legend has it hat these crisp, tart green gems were descendents from the French crabapple trees. Granny Smith apples are a grassy green in colour with white speckling. Their flesh is firm and they are much more resistant to bruising than other varieties. They have a tart, tangy flavour with a crisp bite to them. Granny Smith apples are great when eaten fresh, sliced into salads, baked, or even sautéed. Ida Red apples are a cross between the Wagoner apple and the Jonathan apple. These apples are pale greenish yellow and have a bright crimson-red blush to them. Their flesh is tinted a rosy pink and they are sweet with a hint of tartness. Ida Reds are great for cooking, baking and making apple pies. Ida Red apples make a very pretty pink-coloured applesauce. When you are making the applesauce, cook the apples with their skins on and then strain the sauce to get the pretty pink colour. Jonagold apples were introduced in New York State in 1968. Jonagold apples are a cross between Jonathan apples and the Golden Delicious apples. Jonagolds have a firm and juicy flesh with a sweet, tart flavour. It is an excellent all-purpose apple that you can include in just about any dish that calls for apples. You can serve it sliced with a cheese platter, eaten fresh as a snack or cooked into sauces, pies and tossed into fruit salads. Jonagold apples store well and can be stored in your refrigerator for up to two months. The Lodi is an early-season apple that matures locally usually between late July and early August. While similar to Yellow Transparent apples, Lodi apples have a bright yellowy-green skin that does not become more transparent as the apples mature. They have a soft, juicy, and tart flesh. Because they cook more quickly than other varieties, Lodi apples are often used to make applesauce. McIntosh apples are an old variety of apple that dates way back to 1870 eastern Canada. This apple is still popular and a favourite across Canada. McIntosh apples are a deep red colour with a green background. They have a thin skin and their flesh is white, firm and very juicy. McIntosh apples have a sweet flavour with a fragrant aroma. They are great for eating fresh, good for cooking in sauces and purees. Paula Red apples mature in summer and are one of the better early season eating apples. They are small to medium in size and they have a mild, faint tart flavour. These apples are great for applesauce, apple juice or making apple pies. Red Delicious apples are a deep red colour and have five bumps on the bottom. Juicy and sweet, they are the most popular apples in the apple industry. Introduced to the marketplace in 1874, these apples are heart shaped and has a sweet, juicy flavour. Red Delicious apples make a great snacking apple. Much research has been done into antioxidants and the Red Delicious is highly rated for its high antioxidant properties, above other apple varieties. Royal Gala apples are a cross between the Golden Delicious apples and the Cox’s Orange Pippin apples. They are a red-orange colour and have a crisp, thick flesh that is very fragrant. Royal Gala keeps a little longer than the other apple varieties and makes a great fruit for salads, pies, and apple crisps or sliced into green salads. Spartan apples have a dark red skin. These rich, dark red apples were discovered in 1936 and are a cross between the McIntosh apple and the Newton apple. Their flesh is a pure white and firmer than the McIntosh apples. They are very fragrant and have a delicious flavour that makes them just right for eating fresh as a snack. They can be added to chutneys, soups and they can also be used to make apple pie. If you can’t recognize the name Washington Pink, you may recognize its adopted name, Pink Lady. Also a newbie like the Cameo apples, and also not grown in Canada, this pretty, rosy pink apple originated in Australia in 1985. Washington Pink apples or “Pink Ladies” have a fine textured flesh that is crunchy and crisp. They do not brown easily when cut and they make an attractive addition to fruit platters, salads and cheese trays. These apples make a great applesauce and are also good for baking.